ink_d selects some Valentine treats for you..
ink_d gallery has looked over their wonderful selection of work in the gallery and compiled a selection of LOVE related works. 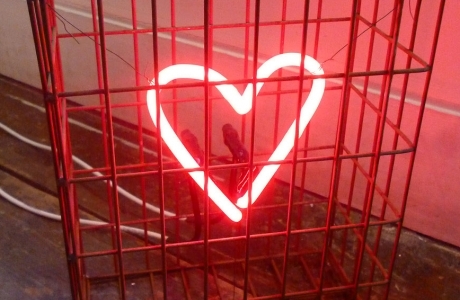 They have a stunning set of Neon work from Andy Doig Safe From Harm, Ti Amo Ti Amo and Don’t Break My Heart. There are three prints from Alex Binnie that tick the box Love, Heart and Love (large). Ryan Callanan is always full of loving – Swarovski Red Heart, Love Is The Drug or call and find out about what Hearts are left. Ian Hodgson has delivered the gallery some love in the shape of a new print – I Feel Love. Benjamin Murphy’s Heart Guns and Anthony Micallef I Brake Everything. The line up would not be complete without the Grande Dame and her Madam And Eve and Adam And Steve or Wedded Bliss in any size. This entry was posted on February 10, 2015 by mptask in Brighton, February 2015, Ink_d and tagged art, brighton, Ink_d, Love, Valentine's Day 2015 Brighton.